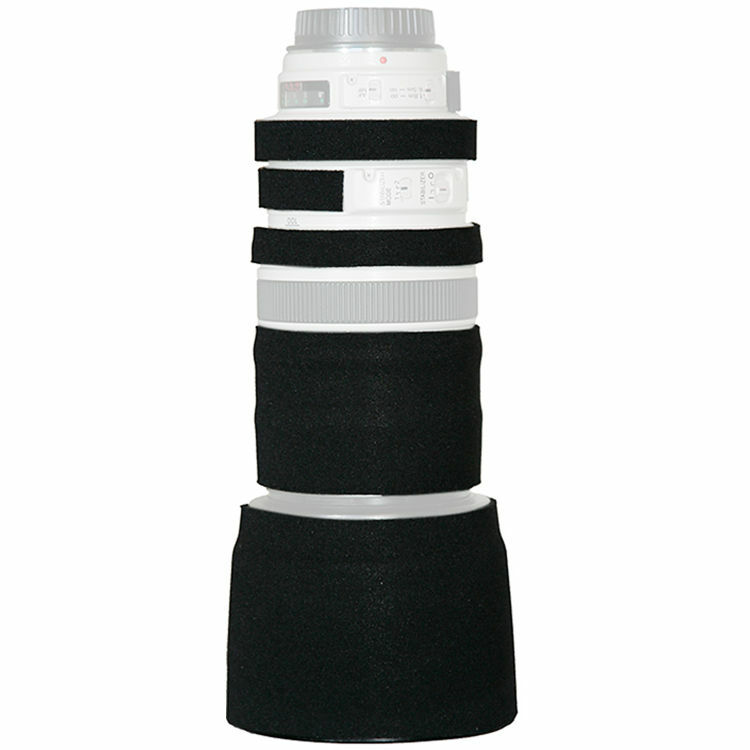 The black Lens Cover for the Canon 100-400mm f/4-5.6 Lens from LensCoat is a 100% closed-cell neoprene coat that protects the lens from bumps and scratches. It is ideal for nature, outdoor photographers, sports shooters and photojournalists. It also provides a thermal barrier, protecting your hands from cold lenses in lower temperatures. The cover is waterproof, providing protection in inclement weather. A LensCoat Lens Cover also provides a thermal barrier, protecting your hands from cold lenses in lower temperatures. It is easy to install and remove, leaving no residue on the lens. This cover will also help you preserve the resale value of the lens by protecting it from dust, dirt and other contaminants.This version is matte black to better blend in where desirable. Or, it can be used just for its protection value. Please note that the LensCoat Canon 100-400 cannot cover the fixed portion of the lens barrel due to the way it extends and retracts, leaving approximately three inches exposed when the lens is fully extended. Box Dimensions (LxWxH) 8.5 x 5.4 x 1.3"
Lens Cover for the Canon 100-400mm f/4-5.6 Lens (Black) is rated 3.8 out of 5 by 45. Rated 1 out of 5 by Anonymous from Lame I ordered the lens coat in black. The largest piece of the coat was for the hood, which is already black so that was pretty pointless. Three other pieces were not even shipped cut to size....it was more of a do it yourself project. And with the design of the 100-400 zoom, large parts of the lens cannot be coated (at least when the lens is zoomed out to 400mm). The vendor does warn about that limitation though until you use the product it is not clear just how big of a difference that makes. Finally, the price was pretty exhorbitant for what you get. I probably would have given it three stars if it cost one quarter of its price. Rated 5 out of 5 by Canon Shooter from Love mine Works as advertised in fact really has exceeded my expectations. Sometimes you read so so reviews but for the most part people do not write when happy about a product. I felt I should write. Fits like a charm, windows do work and my lens is like new, not a scratch or nick to be found. I think after sending all this money on a lens an insurance policy for under $80 is a no brainer. I have other Lens Coat products and so do my friends. In fact look around next time you are out and see how many larger lenses have them, and then ask yourself why. Very much recommended! Rated 2 out of 5 by JoeLena from Not Worth It While I didn't hesitate to spend the extra money to protect an expensive lens, this was just a waste of money. The covering for the tension ring slips off as soon as it's touched, so it's useless. You have to trim to fit the other parts, just not what you would expect for the price. Very disappointing. Rated 1 out of 5 by Eric from Slips, does not protect lens I originally bought this product to protect the lens, but it turned out that it did not work as intended. After slipping the lens into a sling style shoulder bag, the protector shifted, requiring a re-adjustment of the protector once you take it out. It does not really protect against the elements much, since the item is in 3 sections, not a 1-piece system, plus operating the zoom function with this lens leaves a lot of the barrel exposed. You can get better protection against the elements with a plastic grocery bag! I doubt if it would protect well against significant bumps since it is far too thin, and does not adequately protect the front leading edges where damage is more likely. Rated 5 out of 5 by btblue from Great Product I've been using LensCoat products for the last many years and would highly recommend them. Just yesterday I was walking through a wooded area and I can't tell you how many time my camera brushed up against a thorny bush or hanging branch. Bottom line, no scratches on my lens. After 2 years, still don't have to replace the product. Well worth every penny I spent. Rated 3 out of 5 by Mike from Great idea, but quality lacks and price I have a few of the LensCoat products as I want some protection for my gear and there is no alternative Im aware of.Personally, I think LensCoats products are overpriced (and I dont buy the $ to protect $1000 is well spent philosophy, we are talking about neoprene that has a lining). Admittedly, I dont know what their overhead is and perhaps these things are really hard to make.I think I feel this way as when I get the package and I pull out 3-4 pieces of LensCoat I feel I overspent. I say this because the workmanship//quality could be better, especially at that price. For example, the LensCoat for this lens (100-400) comes in several sections (due to lens design) but one of the sections is not tight enough and continually slips off (but I did not catch this in the B&H return window). The covers for the lens hoods are a little short. The windows that usually covers the switches of focus indicator (not applicable to the 100-400, but to others) is a tad too small as well and I feel could be better implemented.Bottom line, I recommend LensCoat begrudgingly (they have saved my lenses from some unexpected bumps) but I am seeking an alternative for less money. Or at least a better product for the same money. Rated 5 out of 5 by Nature Digital Artist from A must-have for nature photographers I can't afford 'big glass'. So I depend on blending into the environment to get closer to birds and wildlife. The cover also provides a nice grip and feel that allows for smooth operation of the lens on my monopod and when handheld. Rated 2 out of 5 by Usbarmc from Not what i expected a lot thinner than i thought it would be. More dress up than protection and i wasnt so pleased finding out i would have to glue it to my lens. The smaller bands were very flimsy. Seems like a good 25 dollar item, not for 100. Is there a LensCoat cover for the Canon 100-400 Mk2? Yes, there is a LensCoat cover this for lens. The wider pieces work ok, but the narrow rings seem to want to migrate or roll off their designated spots and become quite frustrating. Not what you want for something that costs this much. Can you provide a lens cover for pentax 150-450mm lens?